Evans Lane Housing transforms an abandoned storage site near a busy expressway into a community asset for formerly homeless and other sensitive populations in need of affordable housing in the heart of Silicon Valley. Its strategic urban infill location and thoughtful site program address diverse user and neighborhood needs with 61-units ranging from studios to three-bedroom units. 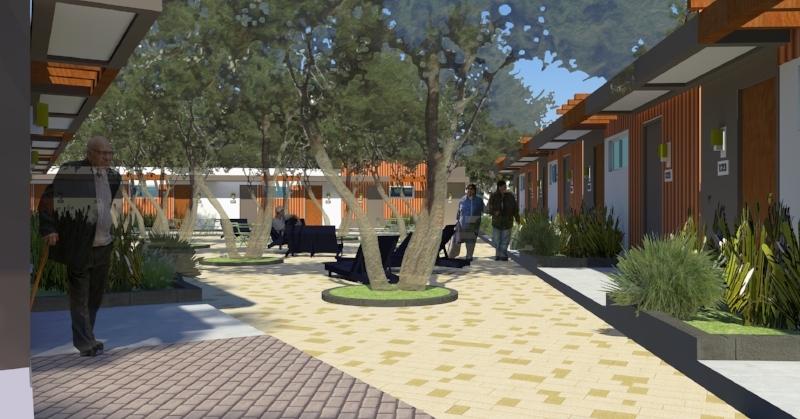 The site is surrounded by amenities including a public branch library and community garden with a dog park, support services, community building and commons for the residents. The library, plaza, bike parking and community garden are situated along Evans Lane to provide an activated and welcoming street frontage in this medium density neighborhood. Integrated sustainable design strategies include renewable energy in the form of rooftop solar PV’s, on site management of 100% of the site’s stormwater, integrated edible landscape, and electric vehicle charging stations.